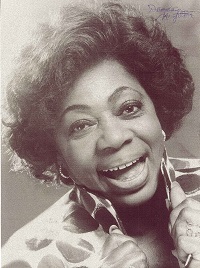 Donna Hightower – Women In Jazz Association, Inc.
Born on December 28, 1926 in Caruthersville, Missouri, singer/songwriter Donna Lubertha Hightower was born into a life of poverty that was typical of African-American sharecropping families. She listened to the radio to escape this hard lifestyle, though she never planned to have a singing career. She recalls being influenced by Ella Fitzgerald, and later, Ella Mae Morse, Kay Starr, Dinah Washington and Hank Williams. She married young, had two children and was divorced by 1950. The next few years would find her recording for RPM records, and performing all over the country touring with Louis Jordon, Johnny Mathis, Tommy Edwards and Della Reese. By 1958, her career had slowed and she had moved to New York City, where she worked at a music publishing house recording demo records. One of those records, “Light of Love,” found its way to Capitol Records producer, Dave Cavanaugh, who then had Peggy Lee to record the song. Later, when a recording session he had scheduled with jazz singer Dakota Staton fell through, Cavanaugh remembered Miss Hightower’s voice and invited her to record in Staton’s place. She recorded two albums, “Take One,” and “Gee Baby, Ain’t I Good to You?” which were both released in 1959. In 1959, Miss Hightower went to England and on to Paris for performance dates with Quincy Jones and The Platters. She found the environment for African-Americans to be much more relaxed abroad, both personally and professionally. She stayed in Europe for the next thirty years, calling Madrid home for over 20 years. It was in Spain that her years of work in the music industry finally began to pay off. After winning a European song festival in 1970, she won the notice of Columbia Records, and was offered a recording contract. It was during this time that she met and collaborated with singer Danny Daniel. Their duet “El Vals de Los Mariposas”(“Waltz of the Butterflies”) became a hit, staying on the charts for more than 20 weeks. Miss Hightower then wrote the lyrics to her biggest hit, “This World Today is a Mess.” That record single was issued internationally and has reportedly sold more than seven million copies to date. It became the song for which she is most closely associated, though she would go on to record and release four albums in Spain, mostly her own compositions. Since Columbia chose not to issue her records in the United States, her fan base remains largely in European countries. Miss Hightower was a devout Christian, and began singing gospel more frequently as her pop icon status faded in the late 1970’s. She said that the Lord told her to move to Austin, Texas—and she did in 1990. She went into semi-retirement but performed frequently at jazz and gospel events in Austin, and returned last to Europe for performances in Spain in 2008. Her last performance was at Buda United Methodist Church the morning before she passed away, where her performance of Bill Gaither’s “He Lives (So I Can Face Tomorrow)” gathered her a standing ovation. She died August 19, 2013.